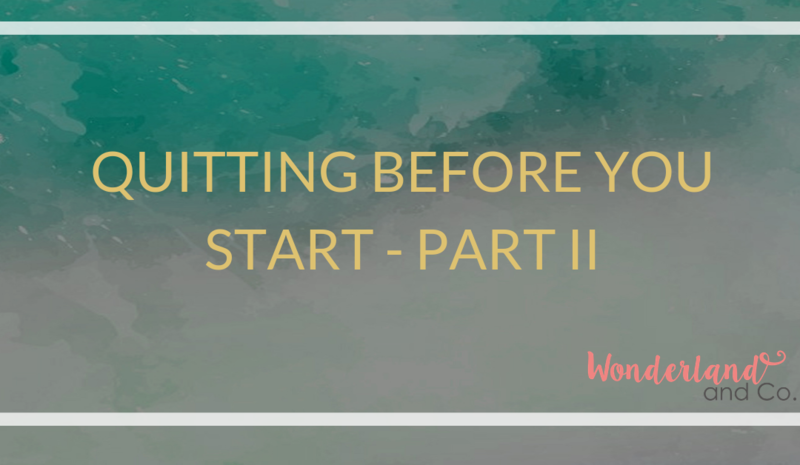 Quitting before you start - Part II - Wonderland & Co.
Last week, I talked about ways that we quit before we start things. More accurately, I shared some of the ways I’ve held myself back from starting things that were, or are, important to me. This week, we’re looking at the same outcome (quitting before we start), but a different modus operandi: Putting stuff in the way. We’ve got lots of circumstances and stuff that gets in our way; though, what I notice is that we tend to put it there. We put stuff in the way of what we want All. The. Time. I see this showing up with people and clients all over the place. One of the first places I see it is in people putting stuff in the way of just having a conversation with me (or any other coach). For example, I often see people request a complimentary session, or just a conversation about what coaching looks like, and then, when it comes time to schedule a call, recuse themselves, saying that they can’t afford a coach, either financially or time wise. It’s not my intention to complain here. Is it frustrating? Sure it is: As a coach, I work with people to get past what’s in the way of what they want, so it’s frustrating when people are unwilling to look and see what might be in it for them. It’s the coach’s heartbreak. It looks a lot like putting the cart before the horse, as they say. I mean, after all, it’s one hour—I’m not proposing marriage here, and the cost of a complimentary session is free (seeing how that is what “complimentary” means). So, before seeing what might be possible, or knowing whether we’re a fit in terms of a coaching relationship, or even knowing what coaching rates are, they decide they can’t afford it. I wonder, how do they know they can’t afford it? They don’t know what it is they can’t afford! To a coach, it’s interesting, though not very surprising. The reaction is pretty common: It’s just fear popping up to say hello. It’s like me not trying to meet with an agent at the beginning, just in case, some day in the distant future, I don’t make it I decide that I’m unsuccessful as an actor and have to choose to give it up. Another way to look at it is to imagine that you’re in Costco right when they’re handing out all the delicious samples and they have chocolate/cheese/whatever you want to taste, but decide not to, in case you like it. Sounds like punishment to me. Why not enjoy a tasty treat, even if a taste is all you decide you want? Maybe you won’t like it, maybe you will, but either way, you get to choose what you do next. No one can make you put it in your cart or do something you don’t want to do. Money and time are often the things that we put in the way of what we want. The insurmountable impossibilities that make us divert our route and take a detour away from what we really want. For example, do you know anyone who wants to be a doctor/actor/musician/___________, but says that it will take too long to get there? Rather than start now and not waste another minute, they give up and settle: They spend an awful lot of energy trying to like something else, expending precious time and effort disliking what they’ve chosen to dedicate their lives to doing instead. And being at effect to the unfairness of it all, too, since they are probably not seeing that by not choosing what they wanted, they chose what they got. Sometimes it’s Money, sometimes it’s the other. Sometimes, it’s both. I call that the double-whammy door jammie. It’s mighty hard to push past it (and yet, the choice to push past it can be so easy, too). And, it’s going to sound super reasonable (remember, fears often do sound that way). Case in point? When I didn’t go to Europe for the summer because I didn’t want to use my student loans. How’d that turn out? In terms of my adventure? Crappy. I stayed home. I didn’t go on my dream European backpacking adventure. But I sure did end up using that student loan money and getting into debt anyway (and a lot of it was on frivolous spending and too much clothes shopping). In retrospect (not that I am regretting my choice, because life is too short), the money was spent anyway. I could have put that money to the best possible use and, as much as I love to shop, shoes and clothes were not the best possible reason to get into debt. So you see, I’m not just pointing the finger, here; I do it all the time. Though I do it less, these days. The thoughts and fears and reasons are all still there, but I give them a lot less time on the open mic, if you will. I realize that the thoughts I entertain have a magical way of becoming reality, so I’m a little pickier with the guests I allow to live in my head. Know what successful people do? They take stuff out of the way. They look at what’s possible, instead of looking for ways to make the possible impossible. They come up with ways to make things work, not reasons why it won’t or can’t. They create gates instead of walls. Most of all, they don’t give up, especially at the beginning. Thank goodness. Electricity, internet, air travel, space exploration… These are but some of the things people haven’t given up on. I wonder what humanity is missing out on because the genius behind the idea quit before they started. Do you recognize yourself in any of this? What might be possible if you said “let’s see” instead of “I can’t”, right at the beginning?